Thursday is a busy day for the stable with runners at the Bendigo and Hawkesbury meetings and we are hopeful of cheering home a winner or two. It's a late start for us with our first runner lining up in the eighth event at Bendigo, the Jayco Handicap. To jump from barrier four with Steven Arnold aboard, imported mare Court Pastoral is having her first run since the spring. "She has had time to acclimatize now," Michael Moroney said, "and we are expecting that she will have a really good preparation." "The 1400m might be a bit short for her but it is not a strong field and on the way she has been working at home we think she can run well - a first three finish would not surprise." Running a much improved race at his latest outing at Sandown, Space is nicely primed for the McCaig Showcase over 2400m. 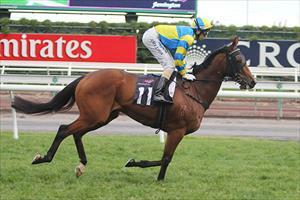 "He showed last time that he is back into form and he has kept improving since," said Moroney. Suited down a little in class, the five-year-old was on the heels of the placegetters at Sandown a couple of weeks ago and he will have derived great benefit from that run, his first at 2400m this time in. "He should prove hard to beat." Contesting the final event on the big ten race card, Rising Stock has drawn wide but a few scratchings have helped his cause. "It is a bit of a tricky gate," Moroney conceded, "but he ran in a strong race last start and this looks easier." "He is still green can do a few things wrong but with the right luck in running he can figure in the finish." Beaten only 1 1/4 lengths at Sandown last time out, Rising Stock will again be ridden by Patrick Moloney. Taking his place in the Hawkesbury Stayers Prelude, Nordic Duke (pictured) ran some nice races in New South Wales last spring and he caught the eye running on well second up at Geelong late last month. "He is going really well," Moroney said, "and he looks hard to beat." "He has a good record going that way around and he is getting up to his right trip now."